I returned late Monday night from my mission trip I took to Budapest, Hungary. I really enjoyed the week. I had a couple of opportunities to take pictures, which is one of my hobbies. 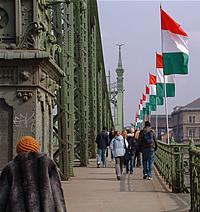 The picture to the right was taken on March 15 which is an important holiday in Hungary. All the bridges were lined with flags. I enjoyed the ministry, seeing friends in the ministry there and meeting some new ones. My team was really great and we were able to have a significant impact in such a short time. It is always a joy to return to Hungary.